More than worthy of St Stephen, the Basilica that carries his name is visible from all over Budapest. Splendidly lit in the evening, it is perhaps the most photographed sight in the city. The dome, at 96 m (315 ft), is the exact height as that of the Parliament, whose builders decided not to go higher. It was built from 1851 to 1905 in the form of a Greek cross, and is the work of three successive architects – József Hild, Miklós Ybl and József Kauser. The Neo-Renaissance dome was designed by Miklós Ybl in 1867. A viewing platform above the cupola is reached by a lift and stairs. The 9,144-kg (9-ton) bell in the North Tower was paid for by German Catholics, who were ashamed that the Nazis had looted the original during their retreat from Budapest at the end of World War II. The original bell was never traced. A life-size marble statue of St Stephen, by sculptor Alajos Stróbl, dominates the main altarof the Basilica. “I am the way and the truth and the life” proclaims the Latin inscription above the Basilica’s main entrance. Situated above the inscription are several statues of Hungarian saints paying homage to the Virgin Mary and the infant Jesus. The mummified forearm of St Stephen is displayed in the Holy Right Hand Chapel near the main altar. It was taken to Dubrovnik in Croatia by Béla IV in the 13th century to protect it from the Tatars. 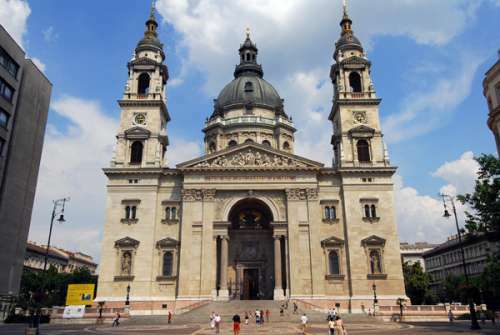 After stints in Vienna and at the Royal Palace in Buda, it was brought here on 20 August 1945 – St Stephen’s Day. A replica of the holy Hungarian crown is the centerpiece of a small but splendid collection of religious jewellery. The original crown is now kept in the Hungarian Parliament Gifts to Hungarian kings from a succession of popes are also on display. The Basilica’s organ was made by Angster & Sons of Pécs, and installed in 1904. At the time, it was considered the world’s finest. The organ was enlarged in 1934, and today comprises no less than 5,898 pipes. You can hear it at special organ concerts, which are held in the Basilica from time to time. The Hotel awaits those who prefer to travel in style in the very heart of Budapest, right next to the buildings of the National Bank and the US Embassy, in one of the most elegant streets of the historical, commercial and parliamentary quarter of Budapest. True elegance awaits you both inside and outside of the building! Outstanding security, spacious shopping parlors, quality entertainment opportunities - these are the characteristics of our Hotel. 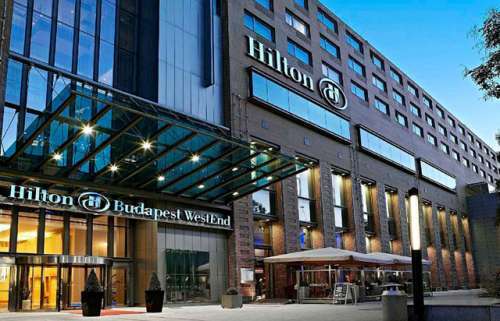 In the heart of the city on the Pest side of the river Danube, the contemporary Hilton Budapest WestEnd hotel offers a peaceful retreat from Pest's cosmopolitan center. Enjoy a short walk toward the Champs-Élysées of Budapest, and the Andrássy Avenue with luxury boutiques and major Budapest attractions, including Parliament, Heroes' Square and St. Stephen's Basilica. Find a tempting array of international shops and entertainment facilities in the WestEnd Shopping Mall with direct connection from the hotel lobby. 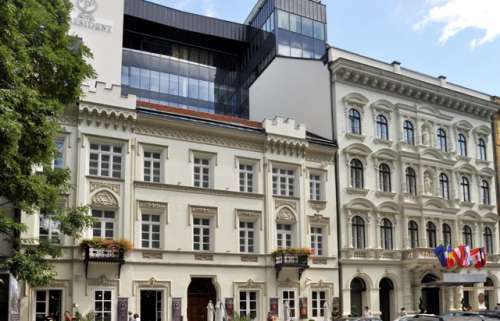 The 110 year old building was restored in the spirit of state-of-the-art architecture, it blends traditional elements with contemporary design and high technology. The hotel harmonizes modern and classical, entertainment and harmony, recreation and discovery, elegance and cosiness. 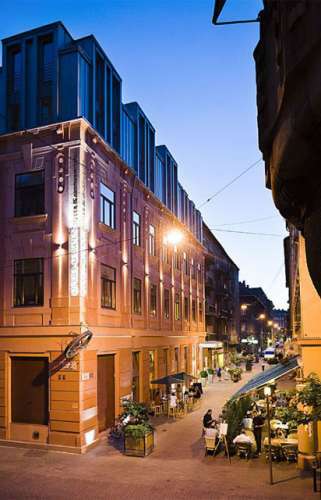 Opera Garden Hotel & Apartments is located in a pedestrian street in the heart of Budapest, just a few blocks away from the Opera House and Andrássy Street, the Hungarian ”Champs-Élysées”, the most famous avenue in Budapest that became part of the World Heritage in 2002. A fabulous street with the atmosphere of Parisian boulevards, luxury shops and restaurants, and the first continental underground. The apartment hotel is positioned only 100 meters from the lively Nagymező Street, called the Budapest Broadway by local people, a place bustling with night life: a great number of quality theatres, bars, restaurants and cafés can be found here and many of the most popular tourist sights are nearby. But take a few steps from the crowded centre along the historic Hajós Street, and the harsh noise of the city fades away.